Trouble is brewing in the land of Sanctuary, which is impressive given it’s almost constantly under attack by hellspawn anyway. 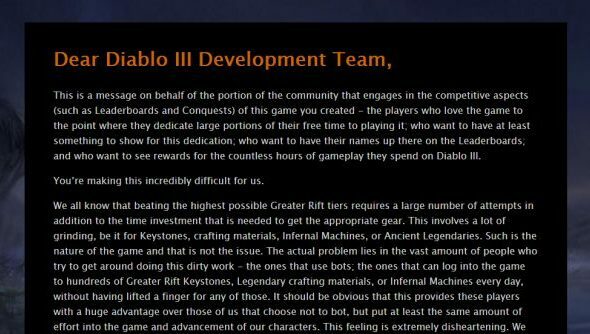 A large number of prominent members of the Diablo 3 community have issued an open letter to Blizzard that something needs to be done about the swathes of players using automated systems to gather resources and level up. This allows them to more easily climb the various leaderboards that serve as the only means of direct competition in Diablo 3, leaving regular players in the dust. Many are naturally unhappy about this and are demanding action from the developer. Diablo 3 became one of our picks for best RPG once it had a few patches in it. You can read the full letter on its own websiteand Reddit, among various community sites that are supporting it. Mikhail also summarised it another video. It’s a very interesting situation. The people that play at the level where this is a problem – i.e. the ones that are actually competitive with other players outside a small circle of friends they want to do more damage than – is a very small subsection of the community, but that doesn’t make them any less valid an audience. They’re incredibly dedicated and willing to spend a huge amount of time to be the best. It’s also true that that group is not going to grow while those using systems to automate the process go unpunished for a year or more. It’s also something of a game design problem, rather than purely one to do with players willing to cheat and break the TOS. That it is a game that is simple enough to be botted is a problem, but so is the fact that the most valuable way to improve power is to grind out Paragon levels, something very dull once your gear is close to perfect. As I said at the start of the new season, it’s very fun to level up normally and then search for new gear and create a build – but these folks are far beyond that. They’re trying to find content deep into the season after hundreds of hours of play on single characters and it’s not there for them. Of course, not everyone agrees. This reply on Reddit, while overly harshly worded, has some good points about the nature of streaming, having fans and how that effects the game. While it is pure nonsense to claim Blizzard doesn’t care about a title which has received multiple massive free updates and sold tens of millions of copies, it makes relevant comments on how this sort of behaviour is incentivised. The implicit “botting is okay” I don’t agree with either, but if it’s so widely used, unpunished and needed to enjoy certain bits of content, I can 100% understand people who do it. We’ve come to this one a bit late, with most of it having kicked off last week. I couldn’t find an official response, or one of any kind, to have come out of Blizzard yet. While Diablo 3’s showing at Blizzcon is tiny – a single panel and not a lot else, which has also brought a lot of ire from the community – I very much doubt they will get past the Q&A section of that without this being brought up. We’ll bring you updates if and when things progress.